Silent brakes are important to car owners and noisy brakes quickly translate into costly after-sales service for the manufacturer. This is why brake noise testing is so important to auto manufacturers and sub-suppliers of brake components. Testing of brakes is not complete without comprehensive road testing. The countless different conditions that arise during real-life use need to be investigated. To enable more efficient road testing of brakes, an extremely robust microphone that can survive thousands of miles of road testing is needed. 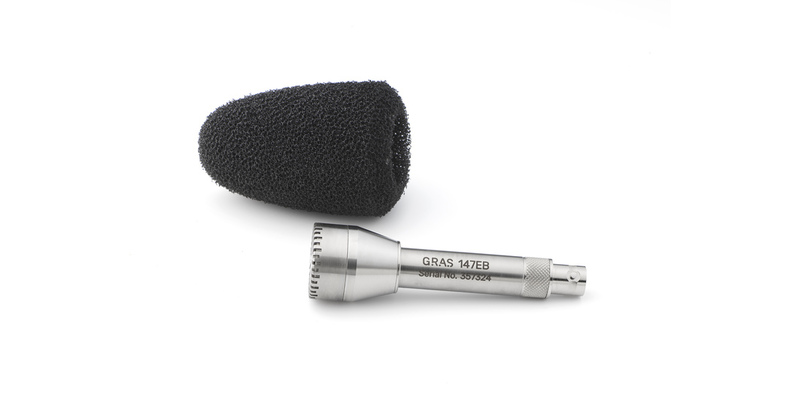 The GRAS 147EB is a free-field microphone set optimized for automotive brake noise testing. With a rugged design and extra protection of the diaphragm it is ideal for prolonged driving tests on public roads. It provides accurate data under the most challenging conditions - it can resist shock, vibration, water, dust and extreme temperatures. It has a watertight BNC connector. 147EB is a free-field microphone optimized for wheelhouse brake noise testing in the automotive industry. It is designed to withstand the conditions in the wheelhouse during prolonged testing on public roads in all types of climate and weather. A rugged design that withstands shock and vibrations combined with a three-layer protection system for the diaphragm enables it to be used for realistic testing of brakes on proving grounds and public roads. The two protective grids and the customized wind screen are easily replaceable consumables. With the 147EB it is now no longer necessary to use sub-standard microphones and cumbersome customized protection for acoustic road testing of brakes - it is now possible to measure without compromising data quality using a high-quality IEC 61672 class 2 microphone. Like other members of the GRAS family of microphones for automotive NVH testing, the 147EB is designed to perform optimally under the rough conditions encountered in automobile NVH testing. The microphone-preamplifier assembly is effectively sealed against moisture and is IP67 rated. A special protective water and oil repellent coating adds further protection and makes it easy to clean. The microphone diaphragm is protected by two grids, a 1/2" grid inside a 1" grid. Each has a comprehensive multi-layer filtering system which ensures good protection against high velocity particles and prevents dirt and dust from polluting the microphone. The filter in the 1/2" grid is acoustically transparent. The filter in the 1" grid is the same filter as that in the 1/2" grid supplemented by a layer of foam. The influence of the 1" grid can be compensated for with the transfer function that is included with the factory calibration. The calibration data and transfer function can be accessed online. Provided the filters are replaced at appropriate intervals this system ensures that the microphone will function properly even in very dirty conditions. The filter also protects the diaphragm against water splashes and oil mists. Exploded view of the two-grid protection system. Both grids are furnished with filters for protection of the diaphragm. A customized wind screen is available. Even if turbulence is not a problem it must be used as the first layer of protection and thus protect the next layer of protection against early contamination. A large, customized windscreen takes care of turbulence but is also a very important part in the protection against moisture and dirt. The 147EB can withstand the effects of handling, including the occasional drop. A new design of the preamplifier and other internal parts makes it resilient to shock and vibrations. It functions well under conditions with vibrations and g-forces from uneven road surfaces and other sudden directional shifts as encountered in real-life driving tests. Even though the microphone will be firmly attached to a vibrating structure and subjected to frequent directional shifts, this fact will not interfere significantly with the measurements. If the effects of vibrations are considered to result in noise, it retains a very good signal-to-noise ratio even in vibration-rich conditions. The most vulnerable part of any condenser microphone is the diaphragm. In the 147EB a more robust type is used. It can be replaced during repair, keeping maintenance costs at a minimum. When mounted in the wheelhouse, the connection between microphone set and cable will be located very close to the road. This is why a special water and heat resistant cable, AA0121, is available. The BNC connector in the microphone set end is located inside a long rubber sleeve which fits tightly around the preamplifier housing. In this way a water proof connection is ensured. The cable is 5 meters long and would be a good choice for a permanent installation. Disconnecting the microphone from the cable is fairly easy. The microphone set works properly up to temperatures of 125°C/257°F and down to -40°C/-40°F. The cable is a high-temperature type. This means that the 147EB can be mounted closely to the road and used in all types of climate and seasons. The comprehensive precautions taken to make the 147EB immune to adverse test conditions result in a number of benefits that all translate into shorter development times and lower costs of ownership. The protection grids with their protective filters can easily be replaced, for example when dirt and oil mists are clogging the meshes. The concept with easily replaceable protection makes maintenance easy and reduces downtime. The total life span of the microphone set will be many times that of a conventional microphone set that must be discarded due to damage from dirt, moisture, shock and vibrations. These advantages mean that the 147EB not only ensures a low cost of ownership for your microphones, but will also contribute to speeding up the development process by improving the quality of your measurements and reducing set-up time. The 147EB requires a constant current of typically 2 mA and is terminated with a BNC connector. Ready to use standard coax cable assemblies of various types and lengths are available. Waterproof, heat and chemical resistant cables are also available. The 147EB is IEEE 1451.4 TEDS v. 1.0 compliant. If your measurement platform supports Transducer Electronic Data Sheets you will be able to read and write data like properties and calibration data. For daily verification and check of your measurement setup, we recommend using a sound source like the GRAS 42AG Multifunction Sound Calibrator. Accessible on-line are also correction data for the protective grid in a format that your analyzer can read at www.gras.dk/e-data. GRAS Traceable Calibration is a traceable calibration performed by trained personnel under controlled conditions according to established procedures and standards. This is identical to the rigorous calibration that all GRAS microphones are subjected to as an integral part of our quality assurance. GRAS Accredited Calibration is performed by the GRAS Accredited Calibration Laboratory that has been accredited in accordance with ISO 17025 by DANAK, the Danish Accreditation Fund. If you want a new microphone set delivered with an accredited calibration instead of the default factory calibration, please specify this when ordering. All parts are manufactured and assembled in Denmark by skilled and dedicated operators in a verified clean-room environment. Our warranty against defective materials and workmanship is 5 years, the windscreen and the protective grids are consumables covered by a 6 month warrany. The warranty does not cover damages to the protection grids caused by their intended use in the challenging conditions in the wheelhouse. GRAS offers a complete overhaul including calibration at a reasonable price. * when corrected for the influence of the 1" grid. ***International Protection Marking, IEC standard 60529. ****IP67: Totally protected against dust, protected against the effect of water of up to 1 m of submersion. The blue curve is the free-field response with 1/2" grid, the dotted orange curve is with 1" grid. This curve can be made equal to the blue curve with the transfer function for the 1" grid. Typical noise floor, linear and A-weighted. GRAS AM0387-1 Windscreen for 147EB, 1 pc. GRAS AM0387-4 Windscreen for 147EB, 20 pcs.